This article is about the 1940 massacre of Polish people, including Polish officers. For the 1943 massacre of Belarusian civilians, see Khatyn massacre. The Katyn massacre (Polish: zbrodnia katyńska, "Katyń crime"; Russian: Катынская резня Katynskaya reznya, "Katyn massacre", or Russian: Катынский расстрел, "Katyn execution by shooting") was a series of mass executions of Polish military officers and intelligentsia carried out by the Soviet Union, specifically the NKVD ("People's Commissariat for Internal Affairs", aka the Soviet secret police) in April and May 1940. Though the killings took place at several places, the massacre is named after the Katyn Forest, where some of the mass graves were first discovered. The massacre was prompted by NKVD chief Lavrentiy Beria's proposal to execute all captive members of the Polish officer corps, dated 5 March 1940, approved by the Politburo of the Communist Party of the Soviet Union, including its leader, Joseph Stalin. The number of victims is estimated at about 22,000. The victims were executed in the Katyn Forest in Russia, the Kalinin and Kharkiv prisons, and elsewhere. Of the total killed, about 8,000 were officers imprisoned during the 1939 Soviet invasion of Poland, another 6,000 were police officers, and the rest were Polish intelligentsia the Soviets deemed to be "intelligence agents, gendarmes, landowners, saboteurs, factory owners, lawyers, officials, and priests". As the Polish Army officer class was representative of the multi-ethnic Polish state, the killed also included Ukrainians, Belarusians, and Polish Jews including the Chief Rabbi of the Polish Army, Baruch Steinberg. 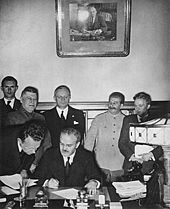 Soviet Foreign Minister Vyacheslav Molotov signs the Molotov–Ribbentrop Pact. Behind him: Ribbentrop and Stalin. On 1 September 1939, the invasion of Poland by Nazi Germany began. Consequently, Britain and France, obligated by the Anglo-Polish military alliance and Franco-Polish alliance to attack Germany in the case of such an invasion, demanded Germany withdraw. On 3 September 1939, after Germany failed to comply, Britain, France, and most countries of the British Empire declared war on Germany, but provided little military support to Poland. They took minimal military action during what became known as the Phony War. The Soviet invasion of Poland began on 17 September in accordance with the Molotov–Ribbentrop Pact. The Red Army advanced quickly and met little resistance, as Polish forces facing them were under orders not to engage the Soviets. About 250,000 to 454,700 Polish soldiers and policemen were captured and interned by the Soviet authorities. Some were freed or escaped quickly, but 125,000 were imprisoned in camps run by the NKVD. Of these, 42,400 soldiers, mostly of Ukrainian and Belarusian ethnicity serving in the Polish army, who lived in the territories of Poland annexed by the Soviet Union, were released in October. 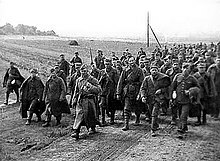 The 43,000 soldiers born in western Poland, then under German control, were transferred to the Germans; in turn, the Soviets received 13,575 Polish prisoners from the Germans. Soviet repressions of Polish citizens occurred as well over this period. Since Poland's conscription system required every nonexempt university graduate to become a military reserve officer, the NKVD was able to round up a significant portion of the Polish educated class. [f] According to estimates by the Institute of National Remembrance (IPN), roughly 320,000 Polish citizens were deported to the Soviet Union (this figure is questioned by some other historians, who hold to older estimates of about 700,000-1,000,000). IPN estimates the number of Polish citizens who died under Soviet rule during World War II at 150,000 (a revision of older estimates of up to 500,000). Of the group of 12,000 Poles sent to Dalstroy camp (near Kolyma) in 1940–1941, mostly POWs, only 583 men survived; they were released in 1942 to join the Polish Armed Forces in the East. According to Tadeusz Piotrowski, "during the war and after 1944, 570,387 Polish citizens had been subjected to some form of Soviet political repression". As early as 19 September, the head of the NKVD, Lavrentiy Beria, ordered the secret police to create the Main Administration for Affairs of Prisoners of War and Internees to manage Polish prisoners. The NKVD took custody of Polish prisoners from the Red Army, and proceeded to organise a network of reception centres and transit camps, and to arrange rail transport to prisoner-of-war camps in the western USSR. The largest camps were at Kozelsk (Optina Monastery), Ostashkov (Stolobny Island on Lake Seliger near Ostashkov), and Starobelsk. Other camps were at Jukhnovo (rail station Babynino), Yuzhe (Talitsy), rail station Tyotkino (90 kilometres (56 mi) from Putyvl), Kozelshchyna, Oranki, Vologda (rail station Zaonikeevo), and Gryazovets. Kozelsk and Starobelsk were used mainly for military officers, while Ostashkov was used mainly for Polish Scouting, gendarmes, police officers, and prison officers. Some prisoners were members of other groups of Polish intelligentsia, such as priests, landowners, and law personnel. The approximate distribution of men throughout the camps was as follows: Kozelsk, 5000; Ostashkov, 6570; and Starobelsk, 4000. They totalled 15,570 men. According to a report from 19 November 1939, the NKVD had about 40,000 Polish POWs: 8,000-8,500 officers and warrant officers, 6,000-6,500 officers of police, and 25,000 soldiers and non-commissioned officers who were still being held as POWs. In December, a wave of arrests resulted in the imprisonment of additional Polish officers. Ivan Serov reported to Lavrentiy Beria on 3 December that "in all, 1,057 former officers of the Polish Army had been arrested". The 25,000 soldiers and non-commissioned officers were assigned to forced labor (road construction, heavy metallurgy). Once at the camps, from October 1939 to February 1940, the Poles were subjected to lengthy interrogations and constant political agitation by NKVD officers, such as Vasily Zarubin. The prisoners assumed they would be released soon, but the interviews were in effect a selection process to determine who would live and who would die. According to NKVD reports, if a prisoner could not be induced to adopt a pro-Soviet attitude, he was declared a "hardened and uncompromising enemy of Soviet authority". It has been suggested that the motive for this terrible step [the Katyn massacre] was to reassure the Germans as to the reality of Soviet anti-Polish policy. This explanation is completely unconvincing in view of the care with which the Soviet regime kept the massacre secret from the very German government it was supposed to impress. […] A more likely explanation is that [the massacre] should be seen as looking forward to a future in which there might again be a Poland on the Soviet Union's western border. Since he intended to keep the eastern portion of the country in any case, Stalin could be certain that any revived Poland would be unfriendly. Under those circumstances, depriving it of a large proportion of its military and technical elite would make it weaker. The Soviet leadership, and Stalin in particular, viewed the Polish prisoners as a "problem" as they might resist being under Soviet rule. Therefore, they decided the prisoners inside the "special camps" were to be shot as "avowed enemies of Soviet authority". The number of victims is estimated at about 22,000, with a lower limit of confirmed dead of 21,768. According to Soviet documents declassified in 1990, 21,857 Polish internees and prisoners were executed after 3 April 1940: 14,552 prisoners of war (most or all of them from the three camps) and 7,305 prisoners in western parts of the Byelorussian and Ukrainian SSRs. [b] Of them 4,421 were from Kozelsk, 3,820 from Starobelsk, 6,311 from Ostashkov, and 7,305 from Byelorussian and Ukrainian prisons. [b] The head of the NKVD POW department, Maj. General P. K. Soprunenko, organized "selections" of Polish officers to be massacred at Katyn and elsewhere. Those who died at Katyn included soldiers (an admiral, two generals, 24 colonels, 79 lieutenant colonels, 258 majors, 654 captains, 17 naval captains, 85 privates, 3,420 non-commissioned officers, and seven chaplains), 200 pilots, government representatives and royalty (a prince, 43 officials), and civilians (three landowners, 131 refugees, 20 university professors, 300 physicians; several hundred lawyers, engineers, and teachers; and more than 100 writers and journalists). In all, the NKVD executed almost half the Polish officer corps. Altogether, during the massacre, the NKVD executed 14 Polish generals: Leon Billewicz (ret. ), Bronisław Bohatyrewicz (ret. ), Xawery Czernicki (admiral), Stanisław Haller (ret. ), Aleksander Kowalewski (ret. ), Henryk Minkiewicz (ret. ), Kazimierz Orlik-Łukoski, Konstanty Plisowski (ret. ), Rudolf Prich (killed in Lviv), Franciszek Sikorski (ret. ), Leonard Skierski (ret. ), Piotr Skuratowicz, Mieczysław Smorawiński, and Alojzy Wir-Konas (promoted posthumously). Not all of the executed were ethnic Poles, because the Second Polish Republic was a multiethnic state, and its officer corps included Belarusians, Ukrainians, and Jews. It is estimated about 8% of the Katyn massacre victims were Polish Jews. 395 prisoners were spared from the slaughter, among them Stanisław Swianiewicz and Józef Czapski. They were taken to the Yukhnov camp or Pavlishtchev Bor and then to Gryazovets. Up to 99% of the remaining prisoners were killed. People from the Kozelsk camp were executed in Katyn Forest; people from the Starobelsk camp were killed in the inner NKVD prison of Kharkiv and the bodies were buried near the village of Piatykhatky; and police officers from the Ostashkov camp were killed in the internal NKVD prison of Kalinin (Tver) and buried in Mednoye. Detailed information on the executions in the Kalinin NKVD prison was provided during a hearing by Dmitry Tokarev, former head of the Board of the District NKVD in Kalinin. According to Tokarev, the shooting started in the evening and ended at dawn. The first transport, on 4 April 1940, carried 390 people, and the executioners had difficulty killing so many people in one night. The following transports held no more than 250 people. The executions were usually performed with German-made .25 ACP Walther Model 2 pistols supplied by Moscow, but Soviet-made 7.62×38mmR Nagant M1895 revolvers were also used. The executioners used German weapons rather than the standard Soviet revolvers, as the latter were said to offer too much recoil, which made shooting painful after the first dozen executions. Vasily Mikhailovich Blokhin, chief executioner for the NKVD—and quite possibly the most prolific executioner in history—is reported to have personally shot and killed 7,000 of the condemned, some as young as 18, from the Ostashkov camp at Kalinin prison, over 28 days in April 1940. The killings were methodical. After the condemned individual's personal information was checked and approved, he was handcuffed and led to a cell insulated with stacks of sandbags along the walls, and a heavy, felt-lined door. The victim was told to kneel in the middle of the cell, and was then approached from behind by the executioner and immediately shot in the back of the head or neck. The body was carried out through the opposite door and laid in one of the five or six waiting trucks, whereupon the next condemned was taken inside and subjected to the same fate. In addition to muffling by the rough insulation in the execution cell, the pistol gunshots were also masked by the operation of loud machines (perhaps fans) throughout the night. Some post-1991 revelations suggest prisoners were also executed in the same manner at the NKVD headquarters in Smolensk, though judging by the way the corpses were stacked, some captives may have been shot while standing on the edge of the mass graves. This procedure went on every night, except for the public May Day holiday. 1939 Polish passport issued to Dr. Zygmunt Sloninski, also a major in the army, to be used for travelling to Switzerland to attend an international medical conference. Issued two months before the outbreak of World War Two. A year later he would be killed by the NKVD. Some 3,000 to 4,000 Polish inmates of Ukrainian prisons and those from Belarus prisons were probably buried in Bykivnia and in Kurapaty respectively, about 50 women among them. Lieutenant Janina Lewandowska, daughter of Gen. Józef Dowbor-Muśnicki, was the only woman P.O.W. executed during the massacre at Katyn. The question about the fate of the Polish prisoners was raised soon after Operation Barbarossa began in June 1941. The Polish government-in-exile and the Soviet government signed the Sikorski–Mayski agreement, which announced the willingness of both to fight together against Nazi Germany and for a Polish army to be formed on Soviet territory. The Polish general Władysław Anders began organizing this army, and soon he requested information about the missing Polish officers. During a personal meeting, Stalin assured him and Władysław Sikorski, the Polish Prime Minister, all the Poles were freed, and not all could be accounted because the Soviets "lost track" of them in Manchuria. Józef Czapski investigated the fate of Polish officers between 1941 and 1942. In 1942, with the territory around Smolensk under German occupation, captive Polish railroad workers heard from the locals about a mass grave of Polish soldiers at Kozelsk near Katyn; finding one of the graves, they reported it to the Polish Underground State. The discovery was not seen as important, as nobody thought the discovered grave could contain so many victims. In early 1943, Rudolf Christoph Freiherr von Gersdorff, a German officer serving as the intelligence liaison between the Wehrmacht's Army Group Centre and Abwehr, received reports about mass graves of Polish military officers. These reports stated the graves were in the forest of Goat Hill near Katyn. He passed the reports to his superiors (sources vary on when exactly the Germans became aware of the graves—from "late 1942" to January–February 1943, and when the German top decision makers in Berlin received those reports [as early as 1 March or as late as 4 April]). Joseph Goebbels saw this discovery as an excellent tool to drive a wedge between Poland, the Western Allies, and the Soviet Union, and reinforcement for the Nazi propaganda line about the horrors of Bolshevism, and American and British subservience to it. After extensive preparation, on 13 April, Reichssender Berlin broadcast to the world that German military forces in the Katyn forest near Smolensk had uncovered a ditch that was "28 metres long and 16 metres wide [92 ft by 52 ft], in which the bodies of 3,000 Polish officers were piled up in 12 layers". The broadcast went on to charge the Soviets with carrying out the massacre in 1940. The Germans brought in a European Red Cross committee called the Katyn Commission, comprising 12 forensic experts and their staff, from Belgium, Bulgaria, Croatia, Denmark, Finland, France, Hungary, Italy, the Netherlands, Romania, Sweden, and Slovakia. The Germans were so intent on proving the Soviets were behind the massacre they even included some Allied prisoners of war, among them writer Ferdynand Goetel, the Polish Home Army prisoner from Pawiak. After the war, Goetel escaped with a fake passport due to an arrest warrant issued against him. Jan Emil Skiwski was a collaborator. Józef Mackiewicz has published several texts about the crime. Two of the 12, the Bulgarian Marko Markov and the Czech František Hájek, with their countries becoming satellite states of the Soviet Union, were forced to recant their evidence, defending the Soviets and blaming the Germans. The Croatian pathologist Eduard Miloslavić managed to escape to the USA. 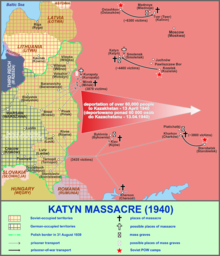 The Katyn massacre was beneficial to Nazi Germany, which used it to discredit the Soviet Union. On 14 April 1943, Goebbels wrote in his diary: "We are now using the discovery of 12,000 Polish officers, killed by the GPU, for anti-Bolshevik propaganda on a grand style. We sent neutral journalists and Polish intellectuals to the spot where they were found. Their reports now reaching us from ahead are gruesome. The Führer has also given permission for us to hand out a drastic news item to the German press. I gave instructions to make the widest possible use of the propaganda material. We shall be able to live on it for a couple of weeks". The Germans won a major propaganda victory, portraying communism as a danger to "Western civilization". The Soviet government immediately denied the German charges. They claimed the Polish prisoners of war had been engaged in construction work west of Smolensk, and consequently were captured and executed by invading German units in August 1941. The Soviet response on 15 April to the initial German broadcast of 13 April, prepared by the Soviet Information Bureau, stated "Polish prisoners-of-war who in 1941 were engaged in construction work west of Smolensk and who...fell into the hands of the German-Fascist hangmen". In April 1943, the Polish government-in-exile led by Sikorski insisted on bringing the matter to the negotiation table with the Soviets and on opening an investigation by the International Red Cross. Stalin, in response, accused the Polish government of collaborating with Nazi Germany and broke off diplomatic relations with it. The Soviet Union also started a campaign to get the Western Allies to recognize the pro-Soviet government-in-exile of the Union of Polish Patriots led by Wanda Wasilewska. Sikorski died in an air crash in July—an event convenient for the Allied leaders. When, in September 1943, Joseph Goebbels was informed the German army had to withdraw from the Katyn area, he wrote a prediction in his diary. His entry for 29 September 1943 reads: "Unfortunately we have had to give up Katyn. The Bolsheviks undoubtedly will soon 'find' that we shot 12,000 Polish officers. That episode is one that is going to cause us quite a little trouble in the future. The Soviets are undoubtedly going to make it their business to discover as many mass graves as possible and then blame it on us". Having retaken the Katyn area almost immediately after the Red Army had recaptured Smolensk, around September–October 1943, NKVD forces began a cover-up operation. They destroyed a cemetery the Germans had permitted the Polish Red Cross to build and removed other evidence. Witnesses were "interviewed" and threatened with arrest for collaborating with the Nazis if their testimonies disagreed with the official line. As none of the documents found on the dead had dates later than April 1940, the Soviet secret police planted false evidence to place the apparent time of the massacre in the summer of 1941, when the German military had controlled the area. NKVD operatives Vsevolod Merkulov and Sergei Kruglov, issued a preliminary report, dated 10–11 January 1944, that concluded the Polish officers were shot by German soldiers. In January 1944, the Soviet Union sent another commission, the Extraordinary State Commission for ascertaining and investigating crimes perpetrated by the German-Fascist invaders to the site; the commission's name implied a predestined conclusion. It was headed by Nikolai Burdenko, the president of the USSR Academy of Medical Sciences (hence the commission is often known as the "Burdenko Commission"), who was appointed by Moscow to investigate the incident. Its members included prominent Soviet figures such as the writer Aleksey Nikolayevich Tolstoy, but no foreign personnel were allowed to join the Commission. The Burdenko Commission exhumed the bodies, rejected the 1943 German findings the Poles were shot by the Soviet army, assigned the guilt to the Nazis, and concluded all the shootings were done by German occupation forces in autumn of 1941. Despite a lack of evidence, it also blamed the Germans for shooting Russian prisoners of war they used as labor to dig the pits. It is uncertain how many members of the commission were misled by the falsified reports and evidence, and how many actually suspected the truth. Cienciala and Materski note the Commission had no choice but to issue findings in line with the Merkulov-Kruglov report, and Burdenko was likely aware of the cover-up. He reportedly admitted something like that to friends and family shortly before his death in 1946. The Burdenko commission's conclusions would be consistently cited by Soviet sources until the official admission of guilt by the Soviet government on 13 April 1990. In January 1944, the Soviets also invited a group of more than a dozen mostly American and British journalists, accompanied by Kathleen Harriman, the daughter of the new American ambassador W. Averell Harriman, and John F. Melby, third secretary at the American embassy in Moscow, to Katyn. Some regarded the inclusion of Melby and Harriman as a Soviet attempt to lend official weight to their propaganda. Melby's report noted the deficiencies in the Soviet case: problematic witnesses; attempts to discourage questioning of the witnesses; statements of the witnesses obviously being given as a result of rote memorization; and that "the show was put on for the benefit of the correspondents". Nevertheless, Melby, at the time, felt on balance the Russian case was convincing. Harriman's report reached the same conclusion and after the war both were asked to explain why their conclusions seemed to be at odds with their findings, with the suspicion the conclusions were what the State Department wanted to hear. The journalists were less impressed and not convinced by the staged Soviet demonstration. Some Western Communists propagated Soviet propaganda, e.g., Alter Brody (introduced by Corliss Lamont) published the text Behind the Polish-Soviet Break. Nazi propaganda poster depicting executions of Polish military officers by the Soviets, with caption in Slovak: "Forest of the dead at Katyn"
The growing Polish-Soviet tension was beginning to strain Western-Soviet relations at a time when the Poles' importance to the Allies, significant in the first years of the war, was beginning to fade, due to the entry into the conflict of the military and industrial giants, the Soviet Union and the United States. In retrospective review of records, both British Prime Minister Winston Churchill and U.S. President Franklin D. Roosevelt were increasingly torn between their commitments to their Polish ally and the demands by Stalin and his diplomats. According to the Polish diplomat Edward Bernard Raczyński, Raczyński and General Sikorski met privately with Churchill and Alexander Cadogan on 15 April 1943, and told them the Poles had proof the Soviets were responsible for the massacre. Raczyński reports Churchill, "without committing himself, showed by his manner that he had no doubt of it". Churchill said "The Bolsheviks can be very cruel". However, at the same time, on 24 April 1943, Churchill assured the Soviets: "We shall certainly oppose vigorously any 'investigation' by the International Red Cross or any other body in any territory under German authority. Such investigation would be a fraud and its conclusions reached by terrorism". Unofficial or classified UK documents concluded Soviet guilt was a "near certainty", but the alliance with the Soviets was deemed to be more important than moral issues; thus the official version supported the Soviets, up to censoring any contradictory accounts. Churchill asked Owen O'Malley to investigate the issue, but in a note to the Foreign Secretary he noted: "All this is merely to ascertain the facts, because we should none of us ever speak a word about it." O'Malley pointed out several inconsistencies and near impossibilities in the Soviet version. Later, Churchill sent a copy of the report to Roosevelt on 13 August 1943. The report deconstructed the Soviet account of the massacre and alluded to the political consequences within a strongly moral framework but recognized there was no viable alternative to the existing policy. No comment by Roosevelt on the O'Malley report has been found. Churchill's own post-war account of the Katyn affair gives little further insight. In his memoirs, he refers to the 1944 Soviet inquiry into the massacre, which found the Germans responsible, and adds, "belief seems an act of faith". At the beginning of 1944, Ron Jeffery, an agent of British and Polish intelligence in occupied Poland, eluded the Abwehr and travelled to London with a report from Poland to the British government. His efforts were at first highly regarded, but subsequently ignored by the British, which a disillusioned Jeffery later attributed to the treachery of Kim Philby and other high-ranking communist agents entrenched in the British system. Jeffery tried to inform the British government about the Katyn massacre, but was as a result released from the Army. In the United States a similar line was taken, notwithstanding two official intelligence reports into the Katyn massacre that contradicted the official position. In 1944, Roosevelt assigned his special emissary to the Balkans, Navy Lieutenant Commander George Earle, to produce a report on Katyn. Earle concluded the massacre was committed by the Soviet Union. Having consulted with Elmer Davis, director of the United States Office of War Information, Roosevelt rejected the conclusion (officially), declared he was convinced of Nazi Germany's responsibility, and ordered that Earle's report be suppressed. When Earle requested permission to publish his findings, the President issued a written order to desist. Earle was reassigned and spent the rest of the war in American Samoa. A further report in 1945, supporting the same conclusion, was produced and stifled. In 1943, the Germans took two U.S. POWs—Capt. Donald B. Stewart and Col. John H. Van Vliet—to Katyn for an international news conference. Documents released by the National Archives and Records Administration in September 2012 revealed Stewart and Van Vliet sent coded messages to their American superiors indicating they saw proof that implicated the Soviets. Three lines of evidence were cited. Firstly, the Polish corpses were in such an advanced state of decay that the Nazis could not have killed them, as they had only taken over the area in 1941. Secondly, none of the numerous Polish artifacts, such as letters, diaries, photographs and identification tags pulled from the graves, were dated later than the spring of 1940. Most incriminating was the relatively good state of the men's uniforms and boots, which showed they had not lived long after being captured. Later, in 1945, Van Vliet submitted a report concluding the Soviets were responsible for the massacre. His superior, Major General Clayton Lawrence Bissell, General George Marshall's assistant chief of staff for intelligence, destroyed the report. Washington kept the information secret, presumably to appease Stalin and not distract from the war against the Nazis. During the 1951–52 Congressional investigation into Katyn, Bissell defended his action before the United States Congress, arguing it was not in the U.S. interest to antagonize an ally (the USSR) whose assistance the nation needed against the Empire of Japan. In 1950, Van Vliet recreated his wartime report. In 2014, a copy of a report van Vliet made in France during 1945 was discovered. From 28 December 1945 to 4 January 1946, a Soviet military court in Leningrad tried seven Wehrmacht servicemen. One of them, Arno Düre, who was charged with murdering numerous civilians using machine-guns in Soviet villages, confessed to having taken part in burial (though not the execution) of 15,000 to 20,000 Polish POWs in Katyn. For this he was spared execution and was given 15 years of hard labor. His confession was full of absurdities, and thus he was not used as a Soviet prosecution witness during the Nuremberg trials. He later recanted his confession, claiming the investigators forced him to confess. At the London conference that drew up the indictments of German war crimes before the Nuremberg trials, the Soviet negotiators put forward the allegation, "In September 1941, 925 Polish officers who were prisoners of war were killed in the Katyn Forest near Smolensk". The U.S. negotiators agreed to include it, but were "embarrassed" by the inclusion (noting the allegation had been debated extensively in the press) and concluded it would be up to the Soviets to sustain it. 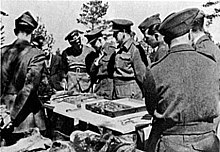 At the trials in 1946, Soviet General Roman Rudenko raised the indictment, stating "one of the most important criminal acts for which the major war criminals are responsible was the mass execution of Polish prisoners of war shot in the Katyn forest near Smolensk by the German fascist invaders", but failed to make the case and the U.S. and British judges dismissed the charges. It was not the purpose of the court to determine whether Germany or the Soviet Union was responsible for the crime, but rather to attribute the crime to at least one of the defendants, which the court was unable to do. In 1951 and 1952, with the Korean War as a background, a congressional investigation chaired by Rep. Ray Madden and known as the Madden Committee investigated the Katyn massacre. It concluded the Poles had been killed by the Soviet NKVD and recommended the Soviets be tried before the International Court of Justice. However, the question of responsibility remained controversial in the West as well as behind the Iron Curtain. In the United Kingdom in the late 1970s plans for a memorial to the victims bearing the date 1940 (rather than 1941) were condemned as provocative in the political climate of the Cold War. 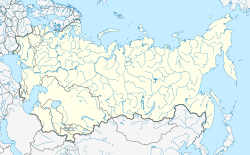 It has also been alleged the choice made in 1969 for the location of the Byelorussian Soviet Socialist Republic war memorial at the former Belarusian village named Khatyn, the site of the 1943 Khatyn massacre, was made to cause confusion with Katyn. The two names are similar or identical in many languages, and were often confused. In Poland, the pro-Soviet authorities following the Soviet occupation after the war covered up the matter in accordance with the official Soviet propaganda line, deliberately censoring any sources that might provide information about the crime. Katyn was a forbidden topic in postwar Poland. Censorship in the Polish People's Republic was a massive undertaking and Katyn was specifically mentioned in the "Black Book of Censorship" used by the authorities to control the media and academia. Not only did government censorship suppress all references to it, but even mentioning the atrocity was dangerous. In the late 1970s, democracy groups like the Workers' Defence Committee and the Flying University defied the censorship and discussed the massacre, in the face of arrests, beatings, detentions, and ostracism. In 1981, Polish trade union Solidarity erected a memorial with the simple inscription "Katyn, 1940". It was confiscated by the police and replaced with an official monument with the inscription: "To the Polish soldiers—victims of Hitlerite fascism—reposing in the soil of Katyn". Nevertheless, every year on the day of Zaduszki, similar memorial crosses were erected at Powązki Cemetery and numerous other places in Poland, only to be dismantled by the police. Katyn remained a political taboo in the Polish People's Republic until the fall of the Eastern Bloc in 1989. Monument in Katowice, Poland, memorializing "Katyn, Kharkiv, Mednoye and other places of killing in the former USSR in 1940"
During the 1980s, there was increasing pressure on both the Polish and Soviet governments to release documents related to the massacre. Polish academics tried to include Katyn in the agenda of the 1987 joint Polish-Soviet commission to investigate censored episodes of the Polish-Russian history. In 1989, Soviet scholars revealed Joseph Stalin had indeed ordered the massacre, and in 1990 Mikhail Gorbachev admitted the NKVD had executed the Poles and confirmed two other burial sites similar to the site at Katyn: Mednoye and Piatykhatky. It isn't a personal pain which has brought me here, as is the case in the majority of these people, but rather recognition of the symbolic nature of Katyń. Russians and Poles, tortured to death, lie here together. It seems very important to me that the truth should be spoken about what took place, for only with the truth can the new Soviet leadership distance itself from the crimes of Stalin and the NKVD. Only the truth can serve as the basis of true friendship between the Soviet and the Polish peoples. The truth will make a path for itself. I am convinced of this by the very fact that I was able to travel here. The fact that the Soviet government has enabled me to be here—and the Soviets know my views—is symbolic of the breach with Stalinism that perestroika represents. His remarks were given extensive coverage on Soviet television. At the ceremony he placed a bouquet of red roses bearing a handwritten message penned in both Polish and English: "For the victims of Stalin and the NKVD. Zbigniew Brzezinski". On 13 April 1990, the forty-seventh anniversary of the discovery of the mass graves, the USSR formally expressed "profound regret" and admitted Soviet secret police responsibility. [a] The day was declared a worldwide Katyn Memorial Day (Polish: Światowy Dzień Pamięci Ofiar Katynia). In 1990, future Russian President Boris Yeltsin released the top-secret documents from the sealed "Package №1." and transferred them to the new Polish president Lech Wałęsa. Among the documents was a proposal by Lavrentiy Beria, dated 5 March 1940, to execute 25,700 Poles from Kozelsk, Ostashkov and Starobelsk camps, and from certain prisons of Western Ukraine and Belarus, signed by Stalin (among others). [d] Another document transferred to the Poles was Aleksandr Shelepin's 3 March 1959 note to Nikita Khrushchev, with information about the execution of 21,857 Poles, as well as a proposal to destroy their personal files to reduce the possibility documents related to the massacre would be uncovered later. [b] The revelations were also publicized in the Russian press, where they were interpreted as being one outcome of an ongoing power struggle between Yeltsin and Gorbachev. In 1991, the Chief Military Prosecutor for the Soviet Union began proceedings against P. K. Soprunenko for his role in the Katyn killings, but eventually declined to prosecute because Soprunenko was 83, almost blind, and recovering from a cancer operation. During the interrogation, Soprunenko defended himself by denying his own signature. During Kwaśniewski's visit to Russia in September 2004, Russian officials announced they were willing to transfer all the information on the Katyn massacre to the Polish authorities as soon as it became declassified. In March 2005 the Prosecutor-General’s Office of the Russian Federation concluded a decade-long investigation of the massacre. Chief Military Prosecutor Alexander Savenkov announced the investigation was able to confirm the deaths of 1,803 out of 14,542 Polish citizens who had been sentenced to death while in three Soviet camps. He did not address the fate of about 7,000 victims who had not been in POW camps, but in prisons. Savenkov declared the massacre was not a genocide, that Soviet officials who had been found guilty of the crime were dead and that, consequently, "there is absolutely no basis to talk about this in judicial terms". 116 out of 183 volumes of files gathered during the Russian investigation were declared to contain state secrets and were classified. On 22 March 2005, the Polish Sejm unanimously passed an act requesting the Russian archives to be declassified. The Sejm also requested Russia to classify the Katyn massacre as a crime of genocide. The resolution stressed the authorities of Russia "seek to diminish the burden of this crime by refusing to acknowledge it was genocide and refuse to give access to the records of the investigation into the issue, making it difficult to determine the whole truth about the killing and its perpetrators." In late 2007 and early 2008, several Russian newspapers, including Rossiyskaya Gazeta, Komsomolskaya Pravda, and Nezavisimaya Gazeta, printed stories that implicated the Nazis in the crime, spurring concern this was done with the tacit approval of the Kremlin. As a result, the Polish Institute of National Remembrance decided to open its own investigation. In 2008, the Polish Foreign Ministry asked the government of Russia about alleged footage of the massacre filmed by the NKVD during the killings, something the Russians have denied exists. Polish officials believe this footage, as well as further documents showing cooperation of Soviets with the Gestapo during the operations, are the reason for Russia's decision to classify most of the documents about the massacre. In the following years, 81 volumes of the case were declassified and transferred to the Polish government. As of 2012[update], 35 out of 183 volumes of files remain classified. In June 2008, Russian courts consented to hear a case about the declassification of documents about Katyn and the judicial rehabilitation of the victims. In an interview with a Polish newspaper, Vladimir Putin called Katyn a "political crime". On 21 April 2010, the Russian Supreme Court ordered the Moscow City Court to hear an appeal in an ongoing Katyn legal case. A civil rights group, Memorial, said the ruling could lead to a court decision to open up secret documents providing details about the killings of thousands of Polish officers. On 8 May 2010, Russia handed over to Poland 67 volumes from "criminal case No. 159", launched in the 1990s to investigate the Soviet-era mass killings of Polish officers. Copies of these volumes, each comprising about 250 pages, were packed in six boxes. With each box weighing approximately 12 kg (26.5 lb), the total weight of all the documents stood at about 70 kg (154 lb). Russian President Dmitry Medvedev handed one of the volumes to the acting Polish president, Bronislaw Komorowski. Medvedev and Komorowski agreed the two states should continue to try to reveal the truth about the tragedy. The Russian president reiterated Russia would continue to declassify documents on the Katyn massacre. The acting Polish president said Russia's move might lay a good foundation for improving bilateral relations. In 2011, the European Court of Human Rights declared admissible two complaints from relatives of the massacre victims against Russia regarding adequacy of the official investigation. In a ruling on 16 April 2012, the court found Russia had violated the rights of victims' relatives by not providing them with sufficient information about the investigation and described the massacre as a "war crime". But it also refused to judge the effectiveness of the Soviet Russian investigation because the related events took place before Russia ratified the Human Rights Convention in 1998. The plaintiffs filed an appeal but 21 October 2013 ruling essentially reaffirmed the prior one, noting Russian courts failed to substantiate adequately why some critical information remained classified. Russia and Poland remained divided on the legal description of the Katyn crime. The Poles considered it a case of genocide and demanded further investigations, as well as complete disclosure of Soviet documents. 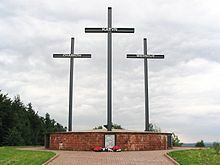 In June 1998, Boris Yeltsin and Aleksander Kwaśniewski agreed to construct memorial complexes at Katyn and Mednoye, the two NKVD execution sites on Russian soil. In September of that year, the Russians also raised the issue of Soviet prisoner of war deaths in the camps for Russian prisoners and internees in Poland (1919–24). About 16,000 to 20,000 POWs died in those camps due to communicable diseases. Some Russian officials argued it was "a genocide comparable to Katyn". A similar claim was raised in 1994; such attempts are seen by some, particularly in Poland, as a highly provocative Russian attempt to create an "anti-Katyn" and "balance the historical equation". The fate of Polish prisoners and internees in Soviet Russia remains poorly researched. On 4 February 2010, the Prime Minister of Russia, Vladimir Putin, invited his Polish counterpart, Donald Tusk, to attend a Katyn memorial service in April. The visit took place on 7 April 2010, when Tusk and Putin together commemorated the 70th anniversary of the massacre. Before the visit, the 2007 film Katyń was shown on Russian state television for the first time. The Moscow Times commented that the film's premiere in Russia was likely a result of Putin's intervention. On 10 April 2010, an aircraft carrying Polish President Lech Kaczyński with his wife and 87 other politicians and high-ranking army officers crashed in Smolensk, killing all 96 aboard the aircraft. The passengers were to attend a ceremony marking the 70th anniversary of the Katyn massacre. The Polish nation was stunned; Prime Minister Donald Tusk, who was not on the plane, referred to the crash as "the most tragic Polish event since the war." In the aftermath, a number of conspiracy theories began to circulate. The catastrophe has also had major echoes in the international and particularly the Russian press, prompting a rebroadcast of Katyń on Russian television. The Polish President was to deliver a speech at the formal commemorations. The speech was to honour the victims, highlight the significance of the massacres in the context of post-war communist political history, as well as stress the need for Polish–Russian relations to focus on reconciliation. Although the speech was never delivered, it has been published with a narration in the original Polish and a translation has also been made available in English. In November 2010, the State Duma (lower house of the Russian parliament) passed a resolution declaring long-classified documents "showed that the Katyn crime was carried out on direct orders of Stalin and other Soviet officials". The declaration also called for the massacre to be investigated further to confirm the list of victims. Members of the Duma from the Communist Party denied the Soviet Union had been to blame for the Katyn massacre and voted against the declaration. On 6 December 2010, Russian President Dmitry Medvedev expressed commitment to uncovering the whole truth about the massacre, stating "Russia has recently taken a number of unprecedented steps towards clearing up the legacy of the past. We will continue in this direction". The Communist Party of the Russian Federation and a number of other pro-Soviet Russian politicians and commentators claim that the story of Soviet guilt is a conspiracy and that the documents released in 1990 were forgeries. They insist that the original version of events, assigning guilt to the Nazis, is the correct version, and they call on the Russian government to start a new investigation that would revise the findings of 2004. Many monuments and memorials that commemorate the massacre have been erected worldwide. There are several Katyn memorials in the UK, the best known of which was unveiled on 18 September 1976 at Gunnersbury Cemetery in London, amid considerable controversy. During the period of the Cold War, successive British governments objected to plans by the UK's Polish community to build a major monument to commemorate the massacre. The Soviet Union did not want Katyn to be remembered, and put pressure on Britain to prevent the creation of the monument. [e] As a result, the construction of the monument was delayed for many years. After the local community had finally secured the right to build the monument, no official government representative was present at the opening ceremony (although some politicians did attend the event unofficially). Another memorial in the UK was erected three years later, in 1979, in Cannock Chase, Staffordshire. A memorial tablet by Ronald Sims has also been installed in the Airmen’s Chapel within Southwell Minster in Nottinghamshire (there is a large Polish community in the county and each year a service is held to remember the massacre). There is also a Katyn memorial in Manchester's Southern Cemetery, unveiled in 1990, on one of the first occasions the British Government publicly acknowledged Katyn was a Soviet, rather than Nazi, war atrocity. In 2000, the memorial at the Katyn war cemetery was opened in Russia. Previously, the site featured a monument with a false dedication to the "victims of the Hitlerites". In Ukraine, a memorial complex was erected to honor the over 4300 officer victims of the Katyń massacre killed in Pyatykhatky, 14 kilometres/8.7 miles north of Kharkiv in Ukraine; the complex lies in a corner of a former resort home for NKVD officers. Children had discovered hundreds of Polish officer buttons whilst playing on the site. In Canada, a large metal sculpture has been erected in the Polish community of Roncesvalles in Toronto, to commemorate the killings. Near Gardekirche in Vienna, Austria, there is a monument both to Katyn and Smolensk Polish tragedies. In South Africa, a memorial in Johannesburg commemorates the victims of Katyn, as well as South African and Polish airmen who flew missions from southern Italy to Poland to drop supplies over Warsaw during the Warsaw Uprising. In the United States, a golden statue known as the National Katyn Massacre Memorial is in Baltimore, Maryland, on Aliceanna Street at Inner Harbor East. Polish-Americans in Detroit erected a small white-stone memorial in the form of a cross with a plaque at the St. Albertus Roman Catholic Church. A statue, the Katyń Memorial, commemorating the massacre has also been erected at Exchange Place on the Hudson River in Jersey City, New Jersey. Other memorial statues are in Doylestown, Pennsylvania and Niles, Illinois. Many cities in Poland now have memorials to the massacre in public spaces as well as within churches and cemeteries. For example, in Wrocław, a composition by Polish sculptor Tadeusz Tchórzewski is dedicated to the Katyn victims. Unveiled in 2000, it is in a park east of the city's centre, near the Racławice Panorama building. It shows the 'Matron of the Homeland' despairing over a dead soldier, while on a higher plinth the angel of death looms over, leaning forward on a sword. The Katyn massacre is a major element in many works of film, the fine arts, literature, and music. Footage of the discovery of the mass graves and exhumation of bodies is included in the 1974 avant-garde film Sweet Movie. Robert Harris' 1995 novel Enigma (subsequently made into a 2001 film) featured the discovery of the Katyn massacre as a central plot point. The 1999 Academy Honorary Award recipient, Polish film director Andrzej Wajda, whose father, Captain Jakub Wajda, was killed in the NKVD prison of Kharkiv, made a film depicting the event, Katyn (2007). It focuses on the fate of some of the mothers, wives and daughters of the Polish officers killed by the Soviets. Some of the Katyn Forest executions were re-enacted. The screenplay is based on Andrzej Mularczyk's book Post mortem—the Katyn story. The film was produced by Akson Studio, and released in Poland on 21 September 2007. It was nominated for an Academy Award in 2008 for the Best Foreign Language Film. U.S. filmmaker Steven Fischer produced a public service announcement titled Silence of Falling Leaves (2000) honoring the fallen soldiers, consisting of images of falling autumn leaves with a sound track cutting to a narration in Polish by the Warsaw-born artist Bożena Jędrzejczak. It was honored with an Emmy nomination. The Polish composer Andrzej Panufnik wrote an orchestral score, called Katyn Epitaph (1967), in memory of the massacre. The work received its premiere on 17 November 1968. Polish poet Jacek Kaczmarski has dedicated one of his sung poems to this event. British historian Laurence Rees produced a six-hour BBC/PBS television documentary series entitled World War II Behind Closed Doors: Stalin, the Nazis and the West (2008). The Katyn massacre was a central theme of the series. The 2018 The Last Witness, a British-Polish film directed by Piotr Szkopiak, told of the British Government's collusion in the cover up of the Katyn massacre. Augustów roundup, 1945, sometimes known as the "Little Katyn massacre"
a ^ (in Russian) Text of the original TASS communiqué released on 14 April 1990.
b ^ (in Russian) Записка председателя КГБ при СМ СССР А.Н. Шелепина Н.С. Хрущеву о ликвидации всех учетных дел на польских граждан, расстрелянных в 1940 г. с приложением проекта постановления Президиума ЦК КПСС. 3 марта 1959 г. Рукопись. РГАСПИ. Ф.17. Оп.166. Д.621. 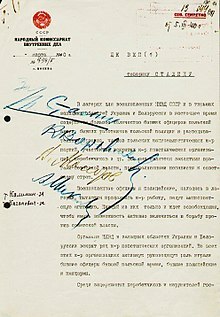 Л.138–139., (Aleksandr Shelepin's 3 March 1959 note to Khrushchev, with information about the execution of 21,857 Poles and with the proposal to destroy their personal files.) retrieved on 12 December 2010. English translation is available in Katyń Justice Delayed or Justice Denied?. c ^ (in Russian)/(in English) "Excerpt from protocol No. 13 of the Politburo of the Central Committee meeting, shooting order of 5 March 1940". Archived from the original on 5 May 2008. Retrieved 11 December 2005. , last accessed on 12 April 2010, original in Russian with English translation. d ^ (in Russian) Докладная записка наркома внутренних дел СССР Л.П. Берии И.В. Сталину с предложением поручить НКВД СССР рассмотреть в особом порядке дела на польских граждан, содержащихся в лагерях для военнопленных НКВД СССР и тюрьмах западных областей Украины и Белоруссии. Март 1940 г. Подлинник. РГАСПИ. Ф.17. Оп.166. Д.621. Л.130–133. Retrieved from the website "Архивы России" (Archives of Russia) on 12 December 2010.
e ^ Politburo Resolution and Instruction for the Soviet Ambassador in London Regarding the Projected Katyn Monument (Excerpt) 2 March 1973, Moscow. f ^ Among them Maj. Gen. Alexandre Chkheidze, who was handed over to the USSR by Nazi Germany per the Molotov–Ribbentrop Pact. ^ a b c d e f g h i j Kużniar-Plota, Małgorzata (30 November 2004). "Decision to commence investigation into Katyn Massacre". Departmental Commission for the Prosecution of Crimes against the Polish Nation. Retrieved 4 August 2011. ^ a b c Engel, David (1993). Facing a holocaust: the Polish government-in-exile and the Jews, 1943–1945. UNC Press Books. p. 71. ISBN 978-0-8078-2069-8. Retrieved 16 June 2011. ^ "Russia to release massacre files". BBC News. 1 November 1989. Retrieved 16 December 2004. ^ Roberts, Geoffrey (2006). Stalin's Wars: from World War to Cold War, 1939–1953. Yale University Press. p. 171. ISBN 978-0-300-11204-7. Retrieved 16 June 2011. ^ "Russian, Polish Leaders To Mark Katyn Anniversary". Radio Free Europe. 6 April 2010. Retrieved 4 August 2011. ^ a b "Russian parliament condemns Stalin for Katyn massacre". BBC News. 26 November 2010. Retrieved 3 August 2011. ^ "Polish-British CDP". britishmilitaryhistory.co.uk. Archived from the original on 2 November 2014. ^ May, Ernest R. (2000). Strange Victory: Hitler's Conquest of France. I. B. Tauris. p. 93. ISBN 978-1-85043-329-3. ^ Horner, David M.; Havers, Robin (2003). The Second World War: Europe, 1939–1943. Taylor & Francis. p. 34. ISBN 978-0-415-96846-1. ^ Werth, Nicholas; Kramer, Mark (15 October 1999). "A State against Its People: Violence, Repression and Terror in the Soviet Union". In Stéphane Courtois (ed.). Livre noir du Communisme: crimes, terreur, répression. Harvard University Press. p. 208. ISBN 978-0-674-07608-2. Retrieved 16 June 2011. ^ a b c d e Rieber, Alfred J. (2000). Forced migration in Central and Eastern Europe, 1939–1950. Psychology Press. pp. 31–33. ISBN 978-0-7146-5132-3. Retrieved 19 May 2011. ^ Meltiukhov, Mikhail. Отчёт Украинского и Белорусского фронтов Красной Армии (in Russian). Retrieved 4 August 2011. ^ Sanford, George (2005). Katyn and the Soviet Massacre of 1940: Truth, Justice and Memory. ROUTLEDGE CHAPMAN & HALL. p. 44. ISBN 978-0-415-33873-8. Retrieved 7 May 2011. ^ a b c Simon-Dubnow-Institut für Jüdische Geschichte und Kultur (2007). Shared History, Divided Memory: Jews and others in Soviet-occupied Poland, 1939–1941. Leipziger Universitätsverlag. p. 180. ISBN 978-3-86583-240-5. Retrieved 19 May 2011. ^ "Ustawa z dnia 9 kwietnia 1938 r. o powszechnym obowiązku wojskowym (Act of 9 April 1938, on Compulsory Military Duty)". Dziennik Ustaw (in Polish). 25 (220). 1938. Archived from the original on 28 September 2007. ^ a b Gmyz, Cezary (18 September 2009). "1.8 mln polskich ofiar Stalina". Rzeczpospolita (in Polish). Retrieved 4 August 2011. ^ a b Szarota, Tomasz; Materski, Wojciech (2009). Polska 1939–1945. Straty osobowe i ofiary represji pod dwiema okupacjami. ISBN 978-83-7629-067-6. Retrieved 19 November 2016. ^ Davies, Norman (September 2008). No Simple Victory: World War II in Europe, 1939–1945. Penguin. p. 292. ISBN 978-0-14-311409-3. Retrieved 19 May 2011. ^ Piotrowski, Tadeusz (September 2007). The Polish Deportees of World War II: Recollections of Removal to the Soviet Union and Dispersal Throughout the World. McFarland. p. 4. ISBN 978-0-7864-3258-5. Retrieved 16 June 2011. ^ a b Cienciala, Anna M.; Materski, Wojciech (2007). Katyn: A Crime without Punishment. Yale University Press. p. 30. ISBN 978-0-300-10851-4. Retrieved 19 May 2011. ^ Zawodny, Janusz K. (1962). Death in the Forest: The Story of the Katyn Forest Massacre. University of Notre Dame Press. p. 77. ISBN 978-0-268-00849-9. ^ Cienciala, Anna M.; Materski, Wojciech (2007). Katyn: a crime without punishment. Yale University Press. p. 81. ISBN 978-0-300-10851-4. Retrieved 19 May 2011. ^ a b c d e f g h i j k l m n o p q r s t u v w x Fischer, Benjamin B. (1999–2000). "The Katyn Controversy: Stalin's Killing Field". Studies in Intelligence (Winter). Retrieved 3 August 2011. ^ Яжборовская, И. С.; Яблоков, А. Ю.; Парсаданова, B.C. (2001). "ПРИЛОЖЕНИЕ: Заключение комиссии экспертов Главной военной прокуратуры по уголовному делу № 159 о расстреле польских военнопленных из Козельского, Осташковского и Старобельского спецлагерей НКВД в апреле—мае 1940 г". Катынский синдром в советско-польских и российско-польских отношениях [The Katyn Syndrome in Soviet-Polish and Russian-Polish relations] (in Russian) (1st ed.). ISBN 978-5-8243-1087-0. Retrieved 9 November 2010. ^ Brown, Archie (9 June 2009). The Rise and Fall of Communism. HarperCollins. p. 140. ISBN 978-0-06-113879-9. Retrieved 7 May 2011. ^ Weinberg, Gerhard (2005). A World at Arms. Cambridge University Press. p. 107. ISBN 978-0-521-61826-7. ^ a b Łojek, Bożena (2000). Muzeum Katyńskie w Warszawie. Agencja Wydawm. CB Andrzej Zasieczny. p. 174. ISBN 978-83-86245-85-7. Retrieved 7 May 2011. ^ a b c Parrish, Michael (1996). The Lesser Terror: Soviet State Security, 1939–1953. Praeger Press. pp. 324, 325. ISBN 978-0-275-95113-9. ^ Andrzej Leszek Szcześniak, ed. (1989). Katyń; lista ofiar i zaginionych jeńców obozów Kozielsk, Ostaszków, Starobielsk. Warsaw, Alfa. p. 366. ISBN 978-83-7001-294-6. ; Moszyński, Adam, ed. (1989). Lista katyńska; jeńcy obozów Kozielsk, Ostaszków, Starobielsk i zaginieni w Rosji Sowieckiej. Warsaw, Polskie Towarzystwo Historyczne. p. 336. ISBN 978-83-85028-81-9. ; Tucholski, Jędrzej (1991). Mord w Katyniu; Kozielsk, Ostaszków, Starobielsk: lista ofiar. Warsaw, Pax. p. 987. ISBN 978-83-211-1408-8. ; Banaszek, Kazimierz (2000). Kawalerowie Orderu Virtuti Militari w mogiłach katyńskich. Roman, Wanda Krystyna; Sawicki, Zdzisław. Warsaw, Chapter of the Virtuti Militari War Medal & RYTM. p. 351. ISBN 978-83-87893-79-8. ; Maria Skrzyńska-Pławińska, ed. (1995). Rozstrzelani w Katyniu; alfabetyczny spis 4410 jeńców polskich z Kozielska rozstrzelanych w kwietniu-maju 1940, według źródeł sowieckich, polskich i niemieckich. Stanisław Maria Jankowski. Warsaw, Karta. p. 286. ISBN 978-83-86713-11-0. ; Skrzyńska-Pławińska, Maria, ed. (1996). Rozstrzelani w Charkowie; alfabetyczny spis 3739 jeńców polskich ze Starobielska rozstrzelanych w kwietniu-maju 1940, według źródeł sowieckich i polskich. Porytskaya, Ileana. Warsaw, Karta. p. 245. ISBN 978-83-86713-12-7. ; Skrzyńska-Pławińska, Maria, ed. (1997). Rozstrzelani w Twerze; alfabetyczny spis 6314 jeńców polskich z Ostaszkowa rozstrzelanych w kwietniu-maju 1940 i pogrzebanych w Miednoje, według źródeł sowieckich i polskich. Porytskaya, Ileana. Warsaw, Karta. p. 344. ISBN 978-83-86713-18-9. ^ a b Snyder, Timothy (12 October 2010). Bloodlands: Europe Between Hitler and Stalin. Basic Books. p. 140. ISBN 978-0-465-00239-9. Retrieved 7 May 2011. ^ Sanford, George (2005). Katyn and the Soviet Massacre of 1940: Truth, Justice and Memory. ROUTLEDGE CHAPMAN & HALL. p. 102. ISBN 978-0-415-33873-8. Retrieved 16 September 2014. ^ Stepanovich Tokariev, Dmitri (1994). Zeznanie Tokariewa (in Polish). Anatoliy Ablokov, Fryderyk Zbiniewicz. Warsaw, Niezależny Komitet Historyczny Badania Zbrodni Katyńskiej. p. 71. , also in Gieysztor, Aleksander; Germanovich Pikhoya, Rudolf, eds. (1995). Katyń; dokumenty zbrodni. Materski, Wojciech; Belerska, Aleksandra. Warsaw, Trio. pp. 547–567. ISBN 978-83-85660-62-0. ^ See for instance: Polak, Barbara (2005). "Zbrodnia katyńska". Biuletyn IPN (in Polish): 4–21. Archived from the original (PDF) on 8 December 2009. Retrieved 22 November 2007. ^ Sebag Montefiore, Simon (2004). Stalin: The Court of the Red Tsar. Random House. p. 334. ISBN 978-1-4000-7678-9. ^ "The Katyn Controversy: Stalin's Killing Field". cia.gov. ^ a b various authors (collection of documents) (1962). Zbrodnia katyńska w świetle dokumentów (in Polish). Foreword by Władysław Anders. Gryf. pp. 16, 30, 257. ^ cheko, Polish Press Agency (21 September 2007). "Odkryto grzebień z nazwiskami Polaków pochowanych w Bykowni". Gazeta Wyborcza (in Polish). Archived from the original on 15 September 2012. Retrieved 21 September 2007. ^ Peszkowski, Zdzisław (2007). "Jedyna kobieta — ofiara Katynia (The only woman victim of Katyn)". Tygodnik Wileńszczyzny (in Polish) (10). Retrieved 22 November 2007. ^ Kukiel, Marian; Jagiełło, Barbara (2003). "Special Edition of Kombatant Bulletin on the occasion of the Year of General Sikorski. Official publication of the Polish government Agency of Combatants and Repressed" (PDF). Kombatant (in Polish) (148). Archived from the original (PDF) on 17 July 2011. Retrieved 3 August 2011. ^ Brackman, Roman (2001). The Secret File of Joseph Stalin: A Hidden Life. Psychology Press. p. 358. ISBN 978-0-7146-5050-0. Retrieved 16 June 2011. ^ a b Polak, Barbara (2005). "Zbrodnia katyńska". Biuletyn IPN (in Polish): 4–21. Archived from the original (PDF) on 8 December 2009. Retrieved 22 November 2007. ^ Balfour, Michael (1979). Propaganda in War 1939–1945: Organisation, Policies and Publics in Britain and Germany. Routledge & Kegan Paul. pp. 332–333. ISBN 978-0-7100-0193-1. ^ Sanford, George (2005). Katyn and the Soviet Massacre of 1940: Truth, Justice and Memory. ROUTLEDGE CHAPMAN & HALL. p. 130. ISBN 978-0-415-33873-8. Retrieved 7 May 2011. ^ Sebastian Chosiński (January – February 2005). "Goetel, Skiwski, Mackiewicz. "Zdrajcy" i "kolaboranci", czyli polscy pisarze oskarżani o współpracę z hitlerowcami" (in Polish). Magazyn ESENSJA Nr 1 (XLIII). Retrieved 25 December 2011. ^ Sanford, George (2005). Katyn and the Soviet Massacre of 1940: Truth, Justice and Memory. ROUTLEDGE CHAPMAN & HALL. p. 131. ISBN 978-0-415-33873-8. Retrieved 7 May 2011. ^ a b Goebbels, Joseph; Translated by Lochner, Louis (1948). The Goebbels Diaries (1942–1943). Doubleday & Company. ^ Zawodny, Janusz K. (1962). Death in the Forest: The Story of the Katyn Forest Massacre. University of Notre Dame Press. p. 15. ISBN 978-0-268-00849-9. ^ Council of Ministers; Polish Government in Exile (1943). "Official statement of the Polish government, on 17 April 1943". Katyn Memorial Wall. Archived from the original on 16 June 2008. Retrieved 22 August 2011. ^ Leslie, Roy Francis (1983). The History of Poland since 1863. Cambridge University Press. p. 244. ISBN 978-0-521-27501-9. ^ "Soviet Note of 25 April 1943, severing unilaterally Soviet-Polish diplomatic relations, English translation of the Russian document". Electronic museum. Archived from the original on 16 June 2008. Retrieved 4 August 2011. ^ Dean, Martin (9 March 2003). Collaboration in the Holocaust: Crimes of the Local Police in Belorussia and Ukraine, 1941–44. Palgrave Macmillan. p. 144. ISBN 978-1-4039-6371-0. Retrieved 16 June 2011. ^ Sandler, Stanley (2002). Ground Warfare: An International Encyclopedia. ABC-CLIO. p. 808. ISBN 978-1-57607-344-5. ^ a b c d e f g h Cienciala, Anna M.; Materski, Wojciech (2007). Katyn: A Crime without Punishment. Yale University Press. pp. 226–229. ISBN 978-0-300-10851-4. Retrieved 2 June 2011. ^ a b c d e f g h i j Rees, Laurence (4 May 2010). World War II Behind Closed Doors: Stalin, the Nazis and the West. Random House Digital, Inc. pp. 243–246. ISBN 978-0-307-38962-6. Retrieved 29 June 2011. ^ "Behind the Polish-Soviet Break – anti-Polish Soviet propaganda -->". latvians.com. ^ Dunn, Dennis J. (1998). Caught between Roosevelt & Stalin: America's ambassadors to Moscow. University Press of Kentucky. p. 184. ISBN 978-0-8131-2023-2. Retrieved 2 June 2011. ^ Raczynski, Edward (1962). In Allied London: The Wartime Diaries of the Polish Ambassador. p. 141. ^ Crawford, Steve (2006). The Eastern Front Day by Day, 1941–45: A Photographic Chronology. Potomac Books. p. 20. ISBN 978-1-59797-010-5. ^ Davies, Norman (20 January 1998). Europe: A History. HarperCollins. p. 1004. ISBN 978-0-06-097468-8. ^ Rees, Laurence (4 May 2010). World War II Behind Closed Doors: Stalin, the Nazis and the West. Random House Digital, Inc. pp. 188–189. ISBN 978-0-307-38962-6. Retrieved 29 June 2011. ^ Churchill, Winston (11 April 1986). The Hinge of Fate. Houghton Mifflin Harcourt. p. 680. ISBN 978-0-395-41058-5. Retrieved 16 June 2011. ^ Jeffery, Ron (1 December 1989). Red runs the Vistula. Nevron Associates. pp. 308–309. ISBN 978-0-908734-00-9. Retrieved 29 June 2011. ^ a b National Archives and Records Administration, documents related to Committee to Investigate and Study the Facts, Evidence, and Circumstances of the Katyn Forest Massacre (1951–52) online, last accessed on 14 April 2010. Also, Select Committee of the US Congress final report: "The Katyn Forest Massacre", House Report No. 2505, 82nd Congress, 2nd Session (22 December 1952) online pdf Archived 9 February 2006 at the Wayback Machine, unofficial reproduction of the relevant parts. ^ "The Katyn Controversy: Stalin's Killing Field — Central Intelligence Agency". Cia.gov. Archived from the original on 17 January 2010. Retrieved 21 February 2011. ^ "Katyn massacre: US hushed up Stalin's slaughter of Polish officers, released memos show". New York Daily News. 10 September 2012. Retrieved 10 September 2012. ^ "Colonel Van Vliet on the Katyn massacre". warbirdforum.com. ^ "Newly-discovered US witness report describes evidence of 1939 Katyn massacre". Fox News Channel. Associated Press. 9 January 2014. Retrieved 6 February 2015. ^ (in Russian) I. S. Yazhborovskaja, A. Yu. Yablokov, V. S. Parsadanova, Катынский синдром в советско-польских и российско-польских отношениях (The Katyn Syndrome in Soviet–Polish and Russian–Polish Relations), Moscow, ROSSPEN, 2001, ISBN 978-5-8243-0197-7, pp. 336–337. (paragraph preceding footnote  in the web version). A review of this book appeared as Cienciala, A. M. (2006). "The Katyn Syndrome". The Russian Review. 65 (1): 117–121. doi:10.1111/j.1467-9434.2005.00389.x. ^ "Excerpts of Nuremberg archives, Fifty-Ninth Day: Thursday, 14 February 1946". Nizkor. 2 January 2006. Retrieved 4 August 2011. ^ Cook, Bernard A. (2001). Europe Since 1945: An Encyclopedia. Taylor & Francis. p. 712. ISBN 978-0-8153-4058-4. Retrieved 6 October 2014. ^ As described by Iona Nikitchenko, one of the judges and a military magistrate having been involved in Stalin's show trials, "the fact that the Nazi chiefs are criminals was already established [by the declarations and agreements of the Allies]. The role of this court is thus limited to determine the precise culpability of each one [charged]". in: Nuremberg Trials, Leo Kahn, Bellantine, NY, 1972, p. 26. ^ Silitski, Vitali (11 May 2005). "A Partisan Reality Show". Transitions Online. Retrieved 4 August 2011. ^ Coatney, Louis Robert (1993). The Katyn Massacre (A Master of Arts Thesis). Western Illinois University. Retrieved 29 October 2010. ^ Schemann, Serge (July 1985). "SOLDIERS STORY' SHARES PRIZE AT MOSCOW FILM FESTIVAL". New York Times: 10. Retrieved 14 April 2010. ^ a b Ouimet, Matthew J. (2003). The rise and fall of the Brezhnev Doctrine in Soviet foreign policy. UNC Press Books. p. 126. ISBN 978-0-8078-5411-2. Retrieved 7 May 2011. ^ a b Cienciala, Anna M.; Materski, Wojciech (2007). Katyn: A Crime without Punishment. Yale University Press. pp. 240–241. ISBN 978-0-300-10851-4. Retrieved 7 May 2011. ^ Sanford, George (2005). Katyn and the Soviet Massacre of 1940: Truth, Justice and Memory. ROUTLEDGE CHAPMAN & HALL. p. 94. ISBN 978-0-415-33873-8. Retrieved 7 May 2011. ^ "Weeping Poles visit Katyn massacre site". United Press International. 30 October 1989. ^ "Commemoration of Victims of Katyn Massacre". BBC News. 1 November 1989. ^ "Brzezinski: Soviets Should Take Responsibility for Katyn Massacre". Associated Press. 30 October 1989. ^ "History: Judgment On Katyn". Time. 13 November 1989. Retrieved 4 August 2011. ^ "Chronology 1990; The Soviet Union and Eastern Europe". Foreign Affairs. 1990. p. 212. ^ Sanford, George (2005). Katyn and the Soviet Massacre of 1940: Truth, Justice and Memory. ROUTLEDGE CHAPMAN & HALL. p. 199. ISBN 978-0-415-33873-8. Retrieved 19 May 2011. ^ a b c Cienciala, Anna M.; Materski, Wojciech (2007). Katyn: A Crime without Punishment. Yale University Press. p. 256. ISBN 978-0-300-10851-4. Retrieved 7 May 2011. ^ "Newsline "...despite Poland's status as 'Key Economic Partner'"". Radio Free Europe. 2 January 2006. Retrieved 4 August 2011. ^ Kondratov, V. K. (2005). Ответ ГВП на письмо общества "Мемориал" [Answer of the General Prosecutor's Office to the letter of the Memorial Society] (in Russian). General Prosecutor's Office of the Russian Federation. Archived from the original on 5 June 2011. Retrieved 8 July 2011. ^ "Statement on investigation of the "Katyn crime" in Russia". Memorial" human rights society. 31 January 2009. Archived from the original on 5 June 2011. Retrieved 4 August 2011. ^ Traynor, Ian (29 April 2005). "Russian victory festivities open old wounds in Europe". Guardian Unlimited. London. Retrieved 4 August 2011. ^ "Katyn Resolution Adopted". Warsaw Voice. 30 March 2005. Retrieved 4 August 2011. ^ a b c "Senate pays tribute to Katyn victims". The Embassy of the Polish Republic in Canada. 31 March 2005. Archived from the original on 20 April 2005. Retrieved 4 August 2011. ^ Europe.view (7 February 2008). "In denial. Russia revives a vicious lie". The Economist. Retrieved 8 July 2011. ^ Joliet, François (16 April 2012). "Wyrok Trybunału w Strasburgu ws. Katynia: Rosja nie wywiązała się ze zobowiązań" [Judgment of the Court in Strasbourg regarding Katyn: Russia does not comply with its obligations] (in Polish). Retrieved 20 April 2012. ^ "Batch of Katyn files handed over to Institute of National Remembrance". Polskie Radio dla Zagranicy. ^ "Dead leaves in the wind: Poland, Russia and history". The Economist. 19 June 2008. Retrieved 4 August 2011. ^ a b "Russian Court Ordered to Hear Appeal in Katyn Case". The New York Times. 21 April 2010. Retrieved 7 May 2010. ^ "Russia hands over volumes of Katyn massacre case to Poland". RIA Novosti. 9 May 2010. Retrieved 9 May 2010. ^ "HUDOC Search Page". coe.int. ^ "European court rules against Russia on 1940 Katyn massacre". Reuters. 16 April 2012. Retrieved 16 April 2012. ^ "Court makes final ruling on World War Two Katyń massacre complaint". humanrightseurope.org. ^ "IPN launches investigation into Katyn crime". IPN. 2 January 2006. Archived from the original on 19 March 2005. Retrieved 4 August 2011. ^ a b Fredheim, Rolf (2014). "The Memory of Katyn in Polish Political Discourse: A Quantitative Study". Europe-Asia Studies. 66 (7): 1165–1187. doi:10.1080/09668136.2014.934135. ^ Rezmer, Waldemar; Zbigniew, Karpus; Matvejev, Gennadij (2004). Krasnoarmieitsy v polskom plenu v 1919–1922 g. Sbornik dokumentov i materialov (in Russian). Federal Agency for Russian Archives. ^ Sanford, George (2005). Katyn and the Soviet Massacre of 1940: Truth, Justice and Memory. ROUTLEDGE CHAPMAN & HALL. p. 8. ISBN 978-0-415-33873-8. Retrieved 19 May 2011. ^ Easton, Adam (4 February 2010). "Russia's Putin invites Tusk to Katyn massacre event". BBC News. Retrieved 19 March 2010. ^ Schwirtz, Michael (7 April 2010). "Putin Marks Soviet Massacre of Polish Officers". The New York Times. ^ "Polish President Lech Kaczyński dies in plane crash". BBC News. BBC. 10 April 2010. Retrieved 10 April 2010. ^ Macintyre, Ben (13 April 2010). "In dark times Poland needs the sunlight of truth". The Times. London. Retrieved 22 July 2011. ^ PAP (11 April 2010). "Rosyjska telewizja państwowa wieczorem pokaże "Katyń" Wajdy". Gazeta Wyborcza. Archived from the original on 3 October 2012. Retrieved 26 August 2011. ^ "Słowa które nie padły". Rzeczpospolita (in Polish). 12 April 2010. Archived from the original on 20 March 2012. Retrieved 4 July 2011. ^ "Medvedev promises whole truth behind Katyn massacre". RIA Novosti. 6 December 2010. Retrieved 8 July 2011. ^ Mukhin, Yuri (2003). Антироссийская подлость Антироссийская подлость [Anti-Russian Treachery]. Реконструкция эпохи (in Russian). Форум. ISBN 978-5-89747-050-1. Retrieved 8 July 2011. ^ Изюмов, Юрий (2005). "Катынь не по Геббельсу." Беседа с Виктором Илюхиным ["Katyn not according to Goebbels." A discussion with Viktor Ilukhin.]. Досье (in Russian) (40). Retrieved 8 July 2011. ^ Наталья Вельк (28 April 2010). Коммунисты настаивают: Катынь устроили фашисты [The Communists Insist: Katyn was Perpetrated by the Fascists] (in Russian). Infox.ru. Retrieved 19 April 2012. ^ a b c d Cienciala, Anna M.; Materski, Wojciech (2007). Katyn: A Crime without Punishment. Yale University Press. pp. 243–245. ISBN 978-0-300-10851-4. Retrieved 16 February 2011. ^ Meller, Hugh (10 March 1994). London Cemeteries: An Illustrated Guide and Gazetteer. Scolar Press. p. 139. ISBN 978-0-85967-997-8. Retrieved 14 January 2011. ^ a b c "Katyn in the Cold War". Foreign and Commonwealth Office. 11 February 2011. Retrieved 4 August 2011. ^ a b c Crozier, Brian (Autumn 2000). "The Katyn Massacre and Beyond". National Observer. Archived from the original on 23 July 2011. Retrieved 4 August 2011. ^ Sanford, George (2005). Katyn and the Soviet Massacre of 1940: Truth, Justice and Memory. ROUTLEDGE CHAPMAN & HALL. p. 195. ISBN 978-0-415-33873-8. Retrieved 16 February 2011. ^ "Tadeusz Lesisz: Pole who sailed with the Royal Navy and saw action on". independent.co.uk. 12 October 2009. Retrieved 20 November 2016. ^ a b "Katyń: Otwarcie polskiego cmentarza wojennego". Fakty/PAP (in Polish). 28 July 2000. Archived from the original on 28 September 2011. Retrieved 4 August 2011. ^ Ascherson, Neal (17 April 2010). "An accident of history". London: The Guardian. Retrieved 29 November 2010. ^ Welcome to Roncesvalles Village (10 April 2010). "Roncesvalles Village Commemorates Tragedy in Poland". Roncesvalles Village. Retrieved 6 August 2011. ^ "About Katyn Memorial". Department of Arts, Culture, and Heritage in the City of Johannesburg. February 2002. Archived from the original on 23 November 2011. Retrieved 4 July 2011. ^ "National Katyn Memorial Foundation Archived 6 March 2008 at the Wayback Machine Archived 6 March 2008 at the Wayback Machine". National Katyn Memorial Foundation, 8 October 2005. Retrieved 4 August 2008. ^ a b Virginia H. (16 April 2010). "Polish-American Artist Among Victims of Plane Crash". US Mission Poland. U.S. Embassy in Warsaw and U.S. Consulate in Kraków. Retrieved 4 July 2011. ^ Karnoutsos, Carmela. "Exchange Place. Paulus Hook". Jersey City. Past and Present. New Jersey City University. Archived from the original on 14 August 2004. Retrieved 4 July 2011. ^ "Wroclaw Statues — Monument to the Victims of the Katyń Massacre". www.wroclaw.ivc.pl. Archived from the original on 21 August 2009. Retrieved 25 February 2011. ^ Ebert, Roger (2010). Roger Ebert's Movie Yearbook 2011. Andrews McMeel Publishing. ISBN 978-1-4494-0618-9. ^ "Balto. indie gets Emmy nod". Mddailyrecord.com. 22 May 2001. Retrieved 19 March 2010. ^ (in Polish) Kaczmarski, Jacek. "Katyń Archived 15 October 2006 at the Wayback Machine". kaczmarski.art.pl, 29 August 1985. Retrieved 5 August 2008. ^ "WWII Behind Closed Doors: Stalin, the Nazis and the West | Clip #1 | PBS". Youtube.com. 25 April 2009. Retrieved 29 November 2010. ^ Rees, Laurence (2010). World War II Behind Closed Doors: Stalin, the Nazis and the West. Random House. p. 5. ISBN 978-0-307-38962-6. ^ Jakubowska, Justyna (2007). "Prezydenci Polski i Gruzji odsłonili pomnik gruzińskich oficerów w Wojsku Polskim". kaukaz.pl (in Polish). Retrieved 22 November 2007. Cienciala, Anna M.; S. Lebedeva, Natalia; Materski, Wojciech, eds. (2008). Katyn: A Crime Without Punishment. Annals of Communism Series. Yale University Press. ISBN 978-0-300-10851-4. Komorowski, Eugenjusz A.; Gilmore, Joseph L. (1974). Night Never Ending. Avon Books. Paul, Allen (2010). Katyń: Stalin's Massacre and the Triumph of Truth. DeKalb, IL: Northern Illinois University Press. ISBN 978-0-87580-634-1. Paul, Allen (1996). Katyń: Stalin's massacre and the seeds of Polish Resurrection. Annapolis, Md. : Naval Institute Press. ISBN 978-1-55750-670-2. Paul, Allen (1991). Katyn: The Untold Story of Stalin's Polish Massacre. Scribner Book Company. ISBN 978-0-684-19215-4. Przewoźnik, Andrzej; Adamska, Jolanta (2011). Zbrodnia katyńska: mord, kłamstwo, pamięć. Wydawn. Literackie. ISBN 9788308046340. OCLC 732798404. In Polish. Sandford, George (2006). "The Katyn Massacre and Polish–Soviet relations 1941–1943" (PDF). Journal of Contemporary History. 41 (1): 95–111. doi:10.1177/0022009406058676. Swianiewicz, Stanisław (2000) . W cieniu Katynia [In the Shadow of Katyn: Stalin's Terror]. Borealis Pub. ISBN 978-1-894255-16-5. Wikimedia Commons has media related to Katyn Massacre. Мемориал "Катын��" (Katyn Memorial Museum, official website). 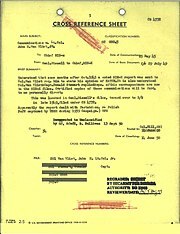 Foreign and Commonwealth Office (FCO) (UK) "The Katyn Massacre: A Special Operations Executive perspective" Historical Papers Official documents, Foreign and Commonwealth Office. Archived by National Archives (UK) on 5 February 2008. Adam Scrupski "Historians Have Yet to Face Up to the Implications of the Katyn Massacre" History News Network 17 May 2004. Benjamin B. Fischer "The Katyn Controversy: Stalin's Killing Field" Studies in Intelligence Winter, 1999–2000. Louis Robert Coatney The Katyn Massacre: An Assessment of its Significance as a Public and Historical Issue in the United States and Great Britain, 1940–1993 (MA Thesis) Western Illinois University, 1993. 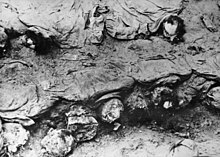 Wacław Radziwinowicz "Katyn Victims Near Kharkov Covered with Lime", trans. Marcin Wawrzyńczak, Gazeta Wyborcza, 10 August 2009. Timothy Snyder "Russia’s Reckoning with Katyń" NYR Blog, New York Review of Books, 1 December 2010. "Truth Is Out: Katyn massacre carried out on Stalin's direct orders" on YouTube Russia Today (official YouTube channel), 26 November 2010.